Actress Emilia Clarke pairs a turquoise shirt with a crisp white skirt. If you've grown tired of rocking simple shades like black, beige and white, reach no further than a turquoise shirt to make a style statement. Depending on what you choose to pair it with, the cool and calming tone of this mix of blue and green has versatile styling capabilities that can make it appropriate for dressy occasions or laid-back strolls around town. Whether you're a guy or gal, turquoise shirts will prove to be a valuable part of your year-round wardrobe, so stock up on at least one of these stylish pieces. Bold turquoise shirts pair well with most neutrals, so compile an outfit of a turquoise shirt with camel or khaki trousers or slacks for something simple but chic. The cool tone of this bright color proves a strong juxtaposition to warm neutrals. Tuck a turquoise blouse into a neutral-hued pencil skirt for a look that's appropriate for the office. Pair glitzy pieces like a sequined turquoise top with a white skirt or white linen pants for a cohesive look that celebrates spring and summer time. Gold or silver jewelry add just the right amount of glamour to these looks. For dressy occasions, pair a turquoise top with a metallic skirt in gold or silver. The nostalgic retro vibe of turquoise is instantly modernized by these metallics. When sporting this look, keep accessories minimal as the bold turquoise and the metallic skirt speak volumes already. 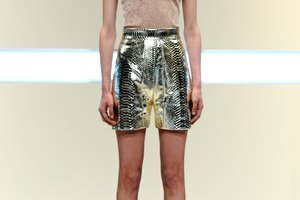 Gold and silver sequined skirts also make for glamorous look when paired with a turquoise shirt. Fabrics with hints of metallics like jacquard will work well, especially one in a darker teal hue that together with your shirt form a trendy and chic monochromatic outfit. While often used as an accent color, use turquoise as a neutral to stabilize an outfit of brights. Accomplish this by pairing a turquoise shirt with other jewel-toned pieces, like deep purple satin trousers. This will create an elegant but fashionable look fit for a wide range of occasions. Other bold hues like chartreuse and fuchsia can do wonders to complement the vivid hue of a classically trendy turquoise shirt. Printed bottoms look fabulous when combined with bold turquoise shirts, so experiment with a variety of styles to form a number of outfits. Peacock-prints incorporating variations of turquoise as well as lovely floral print skirts and pants are natural combinations for this stand-out shade. If full-on printed bottoms aren't quite your style, pair your turquoise shirt with denim jeans and use printed accessories like heels or handbags to enhance and complement this classic piece. Glamour: Spring 2012 Trend You Can Start Wearing Now: Turquoise! Fit And Fab Living: 5 Ways To Wear Turquoise! The Hottest Summer Color! Cantu, Sara. "What Goes Best With a Turquoise Shirt?" Synonym, https://classroom.synonym.com/goes-turquoise-shirt-7061.html. Accessed 23 April 2019.